We’d love your help. Let us know what’s wrong with this preview of The Writing on the Wall by Richard Noble. The King James Bible is a treasure-trove of idioms and clichés that have entered everyone’s vocabulary—and yet few are aware of the Bible as their source. Whether your interest is purely linguistic, theological, or devotional, this book assumes no prior familiarity with the scriptures. By providing the context of each book and phrase it becomes a useful guidebook, bringing The King James Bible is a treasure-trove of idioms and clichés that have entered everyone’s vocabulary—and yet few are aware of the Bible as their source. Whether your interest is purely linguistic, theological, or devotional, this book assumes no prior familiarity with the scriptures. By providing the context of each book and phrase it becomes a useful guidebook, bringing the Bible alive. With 40 phrases in the first section and 25 in the second, it can even be used through the days of Lent and Advent. To ask other readers questions about The Writing on the Wall, please sign up. 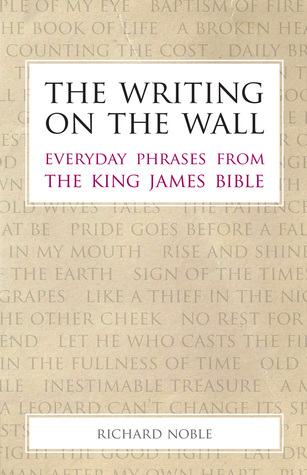 In The Writing on the Wall: Everyday Phrases from the King James Bible, Richard Noble provides a fascinating glimpse into the history of 65 phrases and expressions, now firmly ingrained in everyday speech, which have their roots in the King James Bible. While it may Clichés, expressions, and idioms, they can be the apple of your eye, or a thorn in your flesh – but do you know where these seemingly meaningless phrases originate? If not, this is the perfect book to guide you off to the land of nod. For Christians and non -Christians alike, historians and linguists and those who have an inquiring mind: this book is a delight to dip into or to immerse oneself in. For each book of the King James Bible one is treated to a well-known phrase in the english vocabulary, its original context and its relevance through history to the modern world. A book for the curious....where do phrases such as 'the blind leading the blind', 'the writing on the wall' and 'wheels within wheels ' originally come from? In his relaxed and informative style Richard Noble treats you to the answers. Each chapter whets the appetite for the next...... We are also given wonderfully succinct and useful summaries of the composition and chronology of the Old Testament, the relevance of the Intertestamental Period and the amazing story of God's revelation in the New Testament. 'He was in by the skin of his teeth' said the cricket commentator. Have you ever wondered where such a phrase originated? Richard Noble's engrossing book gives not only the meaning but places it in the context of the particular book of the bible. Over 60 phrases from the King James version of the Bible we frequently use are explored. Valuable for anyone interested in the English language or in the biblical background. In an recent interesting tv programme about William Tyndale, the translator of 'He was in by the skin of his teeth' said the cricket commentator. Have you ever wondered where such a phrase originated? Richard Noble's engrossing book gives not only the meaning but places it in the context of the particular book of the bible. Over 60 phrases from the King James version of the Bible we frequently use are explored. Valuable for anyone interested in the English language or in the biblical background.